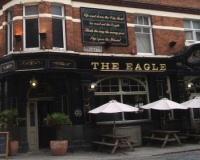 The pub featured in the Pop Goes the Weasel Nursery Rhyme. This rhyme is featured on the wall of the pub. This is another of Charles Dickens watering holes - he certainly enjoyed a beer or two! The original theme of the rhyme seems to have been a darkly humorous portrait of the cycle of poverty of workers in the East End of London. The 'weasel' probably refer to a spinner's weasel, a mechanical yarn measuring device consisting of a spoked wheel with an internal ratcheting mechanism that clicks every two revolutions and makes a 'pop' sound after the desired length of yarn is measured. 'Pop goes the weasel', in this meaning, describes the repetitive sound of a machine governing the tedious work of textile workers toiling for subsistence wages. In the context of the rhyme then the first three lines of each verse describe various ways of spending one's meager wages, with 'pop goes the weasel' indicating a return to unpleasant labor. Alternatively, if 'pop goes the weasel' is taken as cockney rhyming slang, the 'weasel' that goes 'pop' is an item of value that the worker pawns, probably after spending the week's wages (always given on a Saturday). Cockney rhyming slang uses 'pop' meaning to pawn or to redeem a pawned item, while the word 'weasel' means 'coat' (derived from weasel and stoat). If this meaning is taken, the rhyme describes the blowing of the week's wages on staples and drink, and the pawning of the worker's only valuable items - the 'Sunday best' clothing - on Sunday evening or Monday morning, to survive until next Saturday's wage packet.